Marie Françoise-Thérèse Martin was the youngest daughter of Louis and Zélie Martin and was born in Alençon in northern France, in 1873. Soon after birth she became quite ill with enteritis, which had claimed the lives of four of her siblings. Her mother, Zélie, died when Thérèse was four and soon after the family moved to Lisieux. Thérèse was looked after by her sisters and was somewhat indulged. Against the wishes of her father, Louis, she entered the Discalced Carmelite Monastery in Lisieux at the age of fifteen, and took the name Thérèse of the Child Jesus and the Holy Face, though she is much better known as the ‘Little Flower’ or simply Thérèse of Lisieux. In the monastery she was not as indulged as she had been at home, even though some of her sisters were also in the monastery. Thérèse had a number of jobs among which was director of novices which meant that she was responsible for the formation of those in their first year in the monastery. Over time, Thérèse’s spiritual life grew and developed and she began to see the importance of love of neighbour in her life. She also began to understand her own flaws and her place in the great scheme of things. Though she prayed every day, for extended periods of time she had great difficulty in prayer and felt that God was not listening, but still she persevered. Her greatest contribution to spiritual development is known as her ‘Little Way’ in which she acknowledges her littleness and her failings and resolves to use them to help her to get to heaven. Thérèse fell ill with tuberculosis and died in 1897. She was canonized in 1925, named Patroness of the Missions in 1927, and a Doctor of the Church in 1999. St Thérèse is a reminder to us that even the imperfect and those who struggle with prayer, those whose life has known challenges, can still be counted among the greats in the Kingdom. 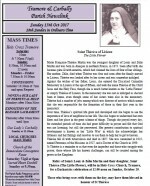 Relics of Saints Louis & Zélie Martin and their daughter, Saint Thérèse (The Little Flower), will be in Holy Cross Church, Tramore, for a Eucharistic celebration at 12.00 noon on Sunday, October 29.